What a great time was had by all that could attend. I encourage all shipmates to try to attend a reunion, you will not be disappointed. This reunion included some fine tours including a bus tour of downtown Charleston - with a great tour guide that entertained as well as informed. A tour of the CS Hunley, the first submarine to sink a war ship. I will never again complain about the room we had on the Key after seeing what those poor souls aboard the Hunley had to endure. None survived to tell us the tales. A tour of Patriots Point and the retired USS Yorktown rounded out the day. Saturday evening we all boarded a ship for a dinner cruise of Charleston Harbor. 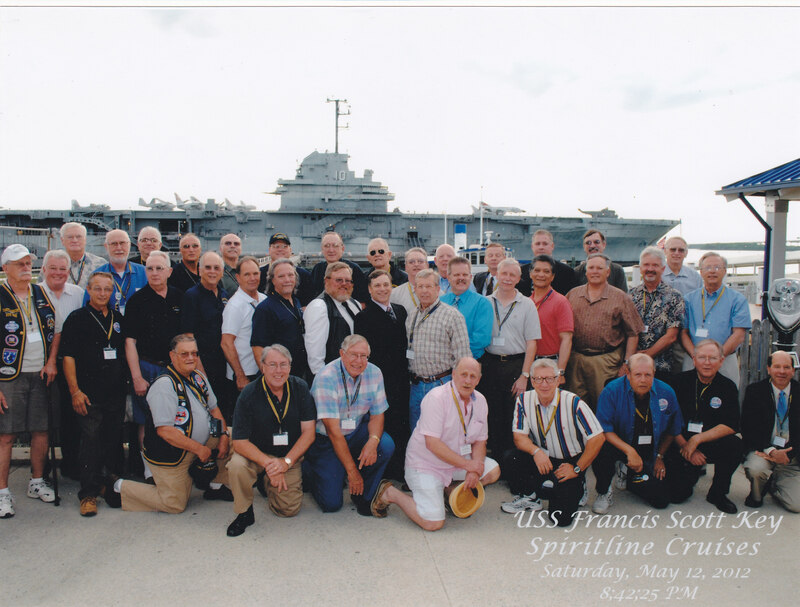 This was the first reunion banquet to be held at sea - well almost at sea. No one get a patrol pin for it - but the food was good. The drinks were better but the company was the best. Thursday and Friday evenings many of us sat around the hospitality suite, had a few beers, and had this web site projected on the wall. We went through many of the pictures and sea stories on the site. It was fortunate to have many of the guys who were present on the Key when a picture or event happened and to hear their explanation of events. Below are some pictures from the reunion. If you have pictures, send them to Russ at ssbn657@comcast.net. 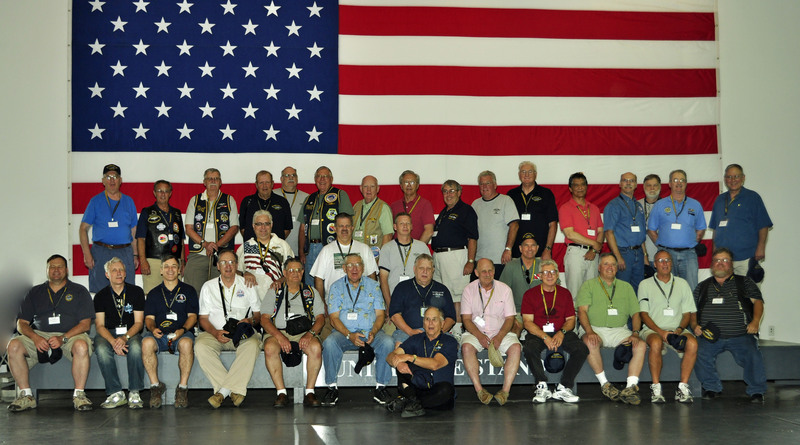 This picture was taken aboard the USS Yorktown at Patriots Point and has all the shipmates that attended the 2012 reunion. Crew of the Key outside of the Yorktown just before boarding for the dinner cruise. OK, so it wasn't all thrills and chills - or is he just showing us how he used to stand watch? On the Battery at Charleston Harbor. The folks running this hotel were first rate and treated us very well. Inside the CS Hunley restoration facility. One thing bother me about the Hunley exhibit. When the Hunley sank the USS Housatonic, five US sailors were killed. No where in this exhibit were they mentioned while all the Hunley crew are featured in great detail including reconstructed heads and pictures of their formal burial. I believe those sailors deserve to be acknowledged for their sacrifice for this country - so I will do it here. After some research, these are the five lost US sailors: Ensign Edward C. Hazeltine, Captain's Clerk Charles O. Muzzey, Quartermaster John Williams, Second-Class Fireman John Walsh, Landsman Theodore Parker. The guys were all lined up for a picture so I took a picture of the picture takers. Thought you might like to see the back of a bunch of heads. Here it comes. We had the whole boat to ourselves - just Key people. There was one guy there with an unusually large head ... - just poking fun at my old buddy David Hall whom I hadn't seen or talked with since 1974. It was like it was yesterday. We might look different but the voice is the same. It was great catching up and it will not be 38 years before we see each other again. This is Jeff Dull, a shipmate from 87 - 89. Jeff was one of the newest shipmates we have had at the reunions. We need to get some of the decom crew from the 90's to attend. The guys in the background are lined up at the bar. The dance floor was kept busy. When the lights are low, no one will know... several of my other pictures were just too dark as they dimmed the lights after dinner was served.